Appearance: Beige background with random fossils that emerge as a result of the polishing process. 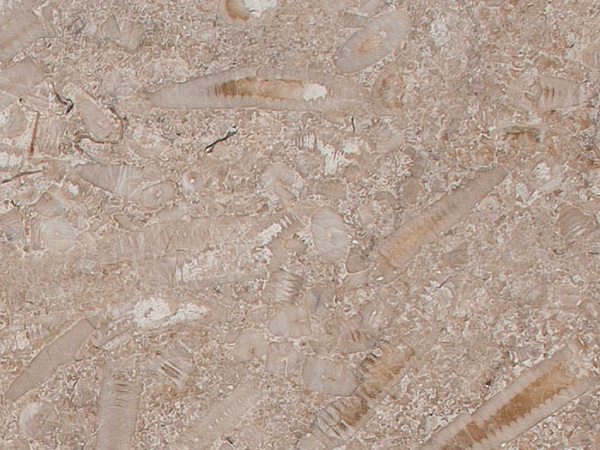 Properties: This Crinoidal limestone is a true rock of ages: over 350 million years old. Its story dramatically reflected by the stunning and large fossils. Like most natural stone, colour variations and and movement occur: these are part of its beauty. It is not acid or frost resistant. It is recommended to seal it to extend its longevity. Use: Due to its good wear resistance and impressive dense finish, this natural stone is suitable for most internal applications, including floors, walls, surfaces and bespoke stonework within both domestic and public environments. It can be admired in the Durham Cathedral (13th century) and as pavements for York Minster (15th century). Formats: Slabs (typical slab size is 2000x1000mm) and cut-to-size.